Go, Tracy, Go! : I'm proud to be a New Yorker. As hoped, the New York Senate voted Friday night to legalize gay marriage (from here on out simply "marriage"). I look forward to the day in the near future when marriage equality is a right we can all take for granted nation-wide, a day when discrimination is no longer written into our legal code. That night, a book club I'm in met at my apartment. (Relevant: we're all runners who met on twitter.) We turned on Rachel Maddow to watch the votes come in and then opened a bottle of sparkling cider - hey, it was all I had! - to celebrate. The next morning, maybe sort of a little dehydrated from the wine and cider, I headed down to Central Park to run the Front Runners 5m race. I met up with Emily at the start so we could run together, and shortly after, the most amazing thing happened: I was sitting near my corral when a woman came up to me and said, "Are you Tracy? I wanted to say hi! I follow you on twitter." We had a nice conversation (hi, Amy, on the off chance you're reading this! hope to see you at Van Cortlandt in a couple of weeks!) and then we all headed into our respective corrals to run the race. There's not too much to say about the race itself. I ran it for the miles rather than racing it, and to that end it was a rousing success. The vibe was more laid back and fun than most NYRR races I've done, and Emily and I chatted for five miles - have I maybe found a new running partner? Evidently Mz. Duffy came up behind us at one point, but I was too busy talking to notice. I talk a lot. An awful lot. 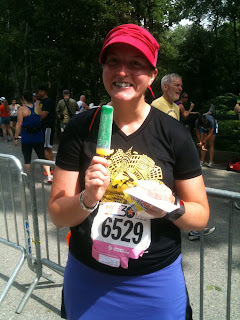 At the end, we had popsicles! Well, Emily didn't want one so I actually had two. They were rainbow popsicles - pardon the blue lips. I would have loved to do the Pride race this year. I heard it was amazing, and people will still in full on celebration mode. Also, free popsicles after a race? Yes please! That popsicle picture is great. Were they not the ultimate cooldown food after that swampy humid mess??? Yep, it's official. You're a Twitter celebrity! I am so happy NY made that decision! And love that someone recognized you off of Twitter! Too cool!